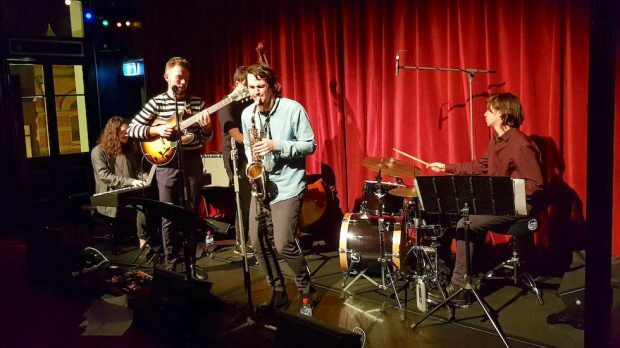 The King Street Corner Pocket Jazz Festival kicked off on Thursday, July 5 across five venues in the CBD. 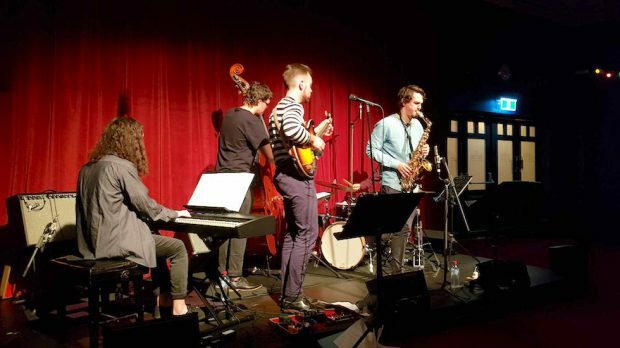 One of which, the Dress Circle Bar was a cosy stage set upstairs in His Majesty’s Theatre where a modestly sized but attentive crowd assembled to catch the Thom Freeman Quintet perform the final set of the inaugural event’s opening night. 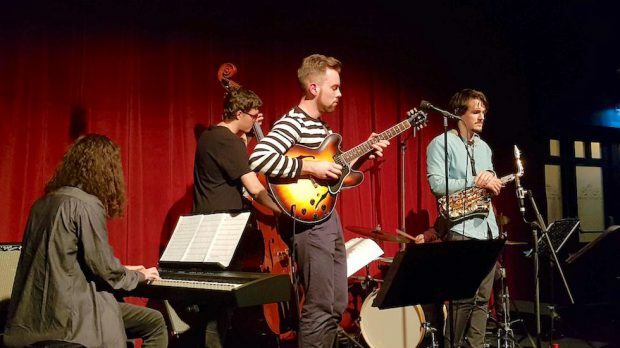 The Thom Freeman Quintet was the first contribution that the WAAPA school of jazz made to the festival, with a line up assembled of some of the finest students delivering a mix of original arrangements and popular reprises of some jazz classics. This was one of the first times he had taken his love and prodigious talent in jazz guitar and formed his own set and a line up to deliver it on stage. Things kicked off at 9pm as the boppy bass got the wheels turning and Freeman, wearing a tobacco Gibson guitar high on his chest gave us the first dose of his slick and intricate riffs that chimed through the mix. The music was stripped back to double bass and keys with timing changes during the arrangement of a jazz standard If I Could Lose You. Next song Black Tower was followed by another Freeman arrangement Faint of Heart which slowed to half time and sunk into a infectious melody before a rapid finish. Freeman then played an “old one” of his, The Tunnel which featured bright but obscure chords that intriguingly seemed to sit somewhere between major and minor keys. Martin’s Last March opened with a delicately balanced intro with the guitar and sax following each other on cascading melody lines before the keys and double bass crept in with a pleasingly sinister counter melody. Freeman then thanked the band and the appreciative audience before going into the closer, In the Crease from Branford Marsalis (one of the many legendary Marsalis brothers). Despite all being exceptionally talented musicians you could tell this performance was no stroll in the park for the Thom Freeman quintet. Over the 45 minutes it was clear that they had undertaken an ambitious and complex choice of original and borrowed arrangements that required them to be at their best to make it all work. It was impressive to see this all come off in fine fashion and it was a great taste of some of the jazz talent on offer in Perth, which is certainly going to reveal itself even more for the duration of this festival and hopefully in years to come.